Understand going in that earthbag building is very physically demanding work. But when compared to the amount of time it takes to work at a job to pay for a mortgage, it really isn't very many hours at all. It took us three months to complete the bag work of the project. The house blends into the desert. Most of the houses around where we built looked odd and out of place. Earthbag structures tend to blend in with the surroundings. It must be all the wonderful curves. This house is the eventual residence of Mark Reppert. It is a double eco dome designed by Cal-Earth. San Bernardino County gave Mark a permit to build the house. The building regulations there are some of the toughest in the country. Cal-Earth has worked extensively with building officials and have a few plans preapproved in that county. The plans can be purchased from their website at calearth.org. We were an international crew of builders. There were 5 core builders with extra volunteers on occasion. We all came together through Ian Lodge. Ian is a classically trained musician turned earth builder. He previously ran a project in Mexico . He is an instructor at Cal-Earth, but also works independently at times. I met Ian through a workshop I took with Nader Khalili at Cal-Earth. The house has 18 inch tubes in the two main domes and 16 inch tubes in the smaller apses. The bags were filled with 70 percent onsite soil, 22 percent gravel, and roughly 8 percent cement. The large domes got two rings of 4 point barbed wire while the apses only need one. Any time we intersect domes the barbed wire is overlapped a couple of feet into the dome it is attached to. The windows are all Roman arches. The space was created using wooden forms, that we gained second hand from a project up the road. Most of the doorways are of a lintel style. The lintels were made using the tubes, but with a higher ratio of cement and also 3 thick pieces of rebar pounded through the bags. I much prefer making arches for their inherent beauty and structural stability. The house is buried in the ground 4 feet except for an entrance patio. We used Henry's asphalt emulsion and 6 mil plastic liner as waterproofing below grade. Joshua tree is basically a desert so water penetration is not a problem like it is in a more humid climate. Heat will eventually be provided via a radiant system buried in the floor. All of the electrical conduit is run underground and shoots up at each of the rooms where needed. Make sure your electrical, plumbing, and heating systems are fully designed at the start of the build. It will cause you headaches if you design these systems after you start. Ideally I think that it is best to install the rough in plumbing and electrical before the first bag is even layed. Another key element to a smooth build is site design. I cannot stress this enough. 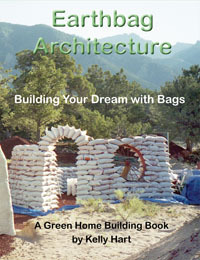 Earthbag building requires many labor hours. Every extra unnecessary step that I take adds on to the time it will take to build the structure. A good site has the bags or tubes near by, but not in the way. The barbed wire also needs to be close by. Your piles of earth ought to be close to the house, but with an adequate path to move around the structure. Think about paths and flows on site, and plan for the highest efficiency possible. Remember your walls will be getting high, so think about how you will move material up and down. If you hire someone to do excavation work, monitor them while they do it and make sure the earth goes exactly where you want it. Also when left alone, some backhoe operators will wreak havoc on delicate natural systems that need your protection. It took us three months to complete the bag work. The cost came in at around $50000 for just the skeleton. The costs were so high because Mark decided to use paid labor. To make Earthbag building successful in a commercial sense, one would really have to focus on making the process as efficient as possible. The labor must be reduced for it to be viable. As far as low income shelters and third world shelters, earthbag buildings are perfect, allowing people to help people build a community of safe and healthy structures. This is a dire need in so many parts of the world, both in richer and poorer countries. A safe shelter frees an individual to pursue higher states of consciousness.